In Assignment Rule Entries in Salesforce, if the first rule is satisfied, rest of the rules will be checked. 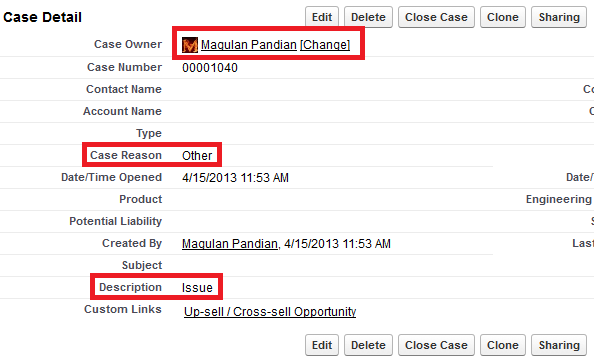 If Case Reason contains 'Other' and Case Description is equal to 'Issue', then the case should be assigned to Magulan Pandian. If Case Reason is equal to 'Other', then case should be assigned to Test. If Case Description is equal to 'Issue', then case should be assigned to Test. If Rule 1 is satisfied, Rule 2 and Rule 3 will not be executed. So, be careful in Rule Entries order of execution. It has been assigned to Magulan Pandian, because Rule 1 is satisfied, other Rules 2 and 3 are not executed. Where to view assigned Tasks in Salesforce? How to add error message in Visualforce page? How to turn off Update Reminder in Salesforce? How to Hide and Show Related Lists in Salesforce?